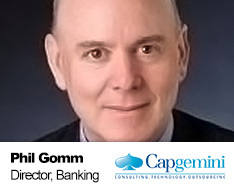 Philip is a Director and the Banking and Capital Markets Practice Leader at Capgemini. Phil works with the senior executive of our banking clients to assist drive technology enabled strategic change. He is deeply familiar with today’s digital transformation agenda. Together with his core banking transformation skills, Phil has globally recognized expertise in payment and payment related systems, and has worked for leading IT professional services organisations including IBM and PwC, where he consulted across multiple Tier 1 Australian Banks and local and international FS organisations. He has held senior technology business engagement roles for both NAB and Australia Post. Today Phil focuses on the Fintech sector and new and emerging disruptive technologies.